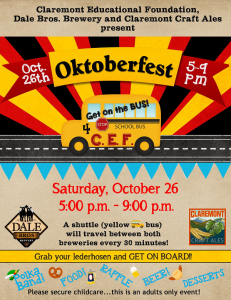 It’s two, two, two festivals in one as Claremont Craft Ales and Upland’s Dale Bros. Brewery team up for Oktoberfest this Saturday (October 26). Partnering with the breweries is Claremont Educational Foundation. The breweries will donate 10% of beer sales to the organization. The event will take place from 5 to 9 p.m.
A yellow school bus will shuttle participants between the two breweries every half hour. In addition to great craft beer, there will be a polka band, raffles, and food from the Corner Butcher and our friends from Pine Haven Cafe and Catering. This is a 21-and-over event. Claremont Craft Ales is at 1420 N. Claremont Blvd., Suite 204C. Dale Bros. Brewery is at 2120 Porterfield Way, Upland.